NIOS 10th, 12th Class exams Hall tickets 2018, Exams start from October 6, NIOS 10th, 12th exams Schedule 2018. The National Institute of Open Schooling (NIOS) will conduct the Class 10 and Class 12 October exams from Saturday, October 6, 2018 onwards. The students can download the hall ticket or admit cards for class 10 and class 12 examinations 2018 from official website - sdmis.nios.ac.in. 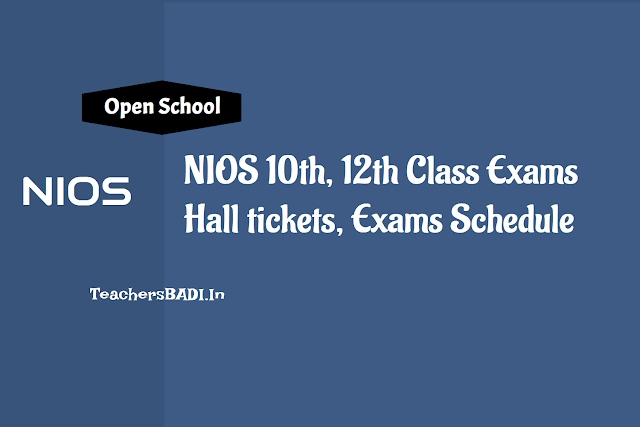 The datesheet for the exam is available at - nios.ac.in. The National Institute of Open Schooling will conduct the Class 10, 12 examinations this week. The 12th examination is scheduled to be held on October 6, and the Class 10 examination October 8. The students who will appear for the examination can download the admit card from the official website, nios.ac.in. The Class 12 examination will begin with Sanskrit on October 6 and Class 10 examination will commence on October 8 with Employability Skills paper. About NIOS : Formerly known as National Open School, NIOS was set up in 1989 as an autonomous organisation by Union Human Resource Development ministry. The examination for two years diploma course in elementary education was conducted in pursuance of Prime Minister’s Digital India campaign. The examination for Class 10 open students is scheduled to begin from October 8, 2018, and for Class 12 students, the exams will start on October 6, 2018. The students who have applied for Open School Class 10 and Class 12 October examination can visit the official website - nios.ac.in - to check and download the admit card. The National School of Open Schooling has released the Hall Ticket or Admit Card of Class 10 (Secondary) and Class 12 (Sr. Secondary) examination 2018. The examination will be held in October-November 2018. Click here to check the time table for the examination for Indian students and Click here for time table of overseas students. The direct link to download the admit card for NIOS Class 10 and Class 12 examination has been provided above. Download the admit cards at the earliest as the website. Check the admit card for details about your examination. The admit card must be kept safely and carried to the examination venue.